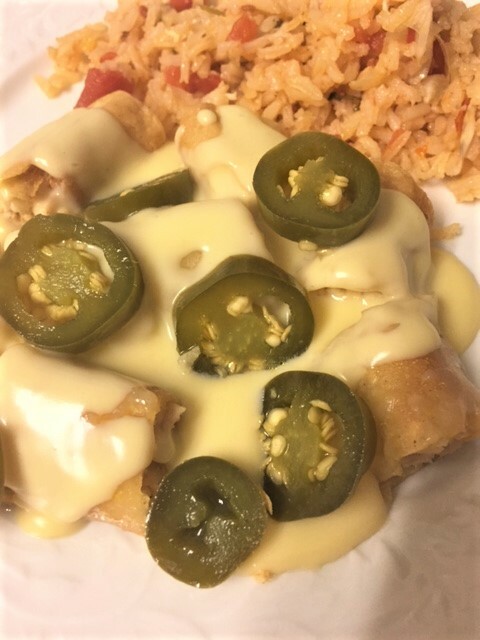 Rolled Tacos with Nacho Cheese Sauce…. There is a Mexican eatery here in San Diego, that has been around for hundreds of years. Well, maybe not quite that long, but it’s been there forever. Whenever I pick up out-of-town guests from the airport, this is the first place they want to go. It’s called El Indio. They have been making fresh tortillas forever and when you walk in, they give you a freshly made, hot tortilla with butter. It’s a good place and has been featured on several tv shows. I have been going there forever. I always get the same thing…….mordaditas. Mm-mm-mmm. 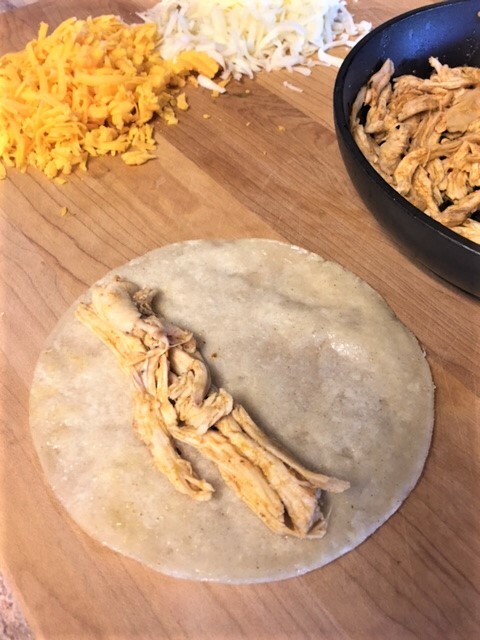 They are crispy rolled tacos, that are cut into bite size pieces. Then, they are smothered in nacho cheese sauce. Then, they are sprinkled with sliced jalapenos. I of course always get mine topped with a dollop of sour cream. Then I pour freshly made salsa all over it. OMG, are you drooling yet? I am! Everyone I know that has had these, loves them. Oh, my, I may have to go get some today. Wanna go? I make them at home sometimes. But rolling tacos are a pain, so I don’t make them often. But I did recently and enjoyed every single bite. Now, sometimes I make my own cheese sauce. But once in a while, I will just buy a canned nacho cheese sauce. Yeah, yeah….I know. Canned? But seriously, there are some good ones out there. Besides, that’s what the restaurant uses! Oh, and if you don’t want to make your own rolled tacos, just buy the frozen ones. Yeah, yeah, I have done that too. But freshly made is much better even though it’s a pain. So, I know you are drooling now so wherever you are, go home and make these now! In a large skillet, heat just a bit of oil. Dip tortillas in, just to soften. Place tortillas on paper towels to drain. Place filling on the tortillas and roll them up. Add more oil into your pan….about a half-inch. Fry the tacos until crispy. Drain on paper towels. Heat your cheese sauce in a sauce pan. 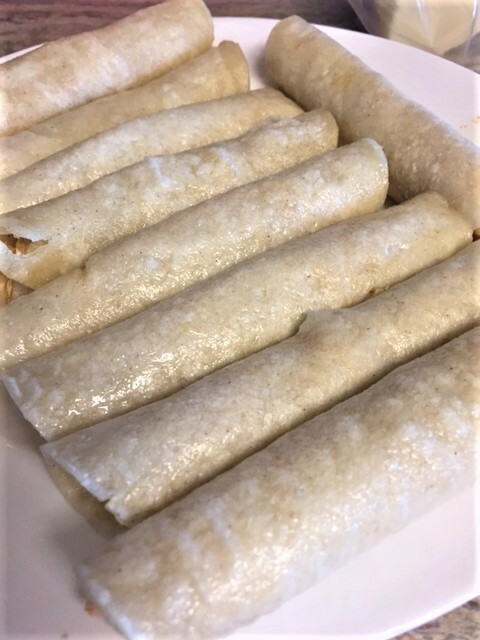 Cut up the rolled taquitos into fourths. Place them onto a plate and pour the cheese sauce over the top. Top with jalapenos, sour cream, guacamole, etc. Devour. In a sauce pan, melt the butter on medium low heat. 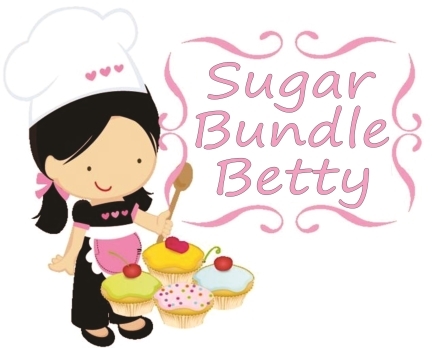 Add the flour and whisk until you have a smooth paste. Don’t let it get real brown. Add the milk and whisk until it’s all nice and smooth. Add the cheese and salsa and stir until cheese is melted and sauce is smooth. * You can also use velveeta cheese which is very creamy.